the worm gear on the sleeve. The worm gear rotates freely on the sleeve for part of the rotation, thus permitting the motor to gain speed before full loading. As the worm gear rotates, the lugs on its face engage the lugs on the face of the clutch bevel gear. Rotation of the clutch bevel gear, which is splined to the sleeve, rotates the sleeve, which is directly connected to the screw of the retractable sheave, thus raising the sheave. When the sleeve rotates, the limit bevel gear, keyed to the sleeve, rotates to turn the pinion of the geared limit switch. This is the only function of the limit bevel gear. When a predetermined point is reached by the rotor of the geared limit switch, the RAISE circuit is broken and the raising operation ceases. As the geared limit switch is actuated, the green lamp (sheave UP lamp) will light in the deckedge light box. Energizing the motor to lower the retractable sheave, by depressing the LOWER push button, causes the motor and the drive system to operate in the reverse direction. Again there is free rotation until the lugs on the worm gear make a complete revolution before striking the other side of the lugs on the clutch bevel gear. The sheave lowers until it is completely seated and opens the torque limit switch to break the motor circuit. If an obstruction prevents the sheave from descending, the worm, which is still rotating because of the force of the motor, does not turn the worm gear. The worm is driven axially along the wormshaft until the torque limit switch is opened by the tripping plate washer. The torque limit switch may be adjusted to permit the sheave to seal with a predetermined force before the circuit is interrupted. The torque spring then absorbs the remaining inertia of the system after the circuit is broken. During the time the sheave is lowered and raised up until the time the RAISE geared limit switch is tripped, the red (sheave NOT UP) lamp glows on the deckedge light box. For manual operation, the handwheel must be mounted on its shaft and secured to the shaft with a setscrew. The declutch lever must then be thrown in a counterclockwise direction. This movement will slide the clutch bevel gear along the splined section of the sleeve to engage a gear on the handcrank shaft. When the handcrank is turned, the sleeve turns, rotating the sheave screw to raise or lower the sheave. The declutch lever remains in the clutch position until operation under motor power is resumed, at which time the handwheel is disconnected automatically by the clutch trippers. There is no danger to an operator if he or she is turning the handwheel when the motor is started, because the handwheel is disengaged instantly without shock or jolt. Thru-deck Sheave The thru-deck sheave (fig 3-23) is mounted vertically and it guides the purchase cable between the sheave damper and the retractable sheave installation. Fairlead Sheaves Fairlead sheaves (fig. 3-23) are single sheaves that are installed at points in the drive system where the purchase cable require a change of direction. The number of fairlead sheaves varies based on engine location in relation to the location of the anchor and sheave dampers. Crossdeck Pendants The polyester-core crossdeck pendant are made of 1 7/16-inch diameter, 6 × 30 flattened strand polyester core construction with no filler wires, all wires are considered loading bearing with a minimum breaking strength of 205,000 pounds. To differentiate polyester-core CDPs from sisal-core CDPs the polyester-core terminals have a groove around the end where the cable enters the terminal. The deck pendant cable ends are equipped with swaged-type terminals. These terminals are pinned to the clevis and socket assembly at the purchase cable coupling for quick detachment during replacement. The sisal-core crossdeck pendant are made of 1 3/8-inch diameter, 6 × 30 flattened strand construc- tion, preformed, uncoated lang lay wire rope with a minimum breaking strength of 188,000 pounds. Each wire rope is made up of 6 steel strands, each of which is a bundle of 12 major and 12 intermediate wires twisted around a triangular core of 3 to 9 wires. (See fig. 3-31.) 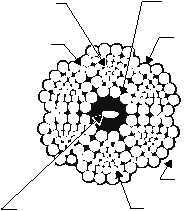 The strands are twisted about an oiled-hemp center 3-31 TRIANGULAR CORE CORE (HEMP, FIBER) 12 MAJOR WIRES 6 STRANDS PER CABLE 12 INTERMEDIATE WIRES MANUFACTURER'S IDENTIFICATION TAPE INTERFACE 2 1 6 5 4 3 ABEf0331 Figure 3-31.Cross section of preformed sisal core 6 × 30 crossdeck pendant.